Snapping apart those disposable, wooden chopsticks — and hoping that they break evenly without too many splinters — is a familiar ritual before enjoying meals at Asian restaurants. But sadly, those seemingly innocuous sticks could pose a risk to your health, and they certainly cause environmental harm. Over 25 million mature trees are cut each year just to produce those single-use chopsticks that get tossed shortly after. Disposable chopsticks are made by boiling them in toxic chemicals. Notice how all throwaway chopsticks are pretty well consistently uniform in grain and color? That doesn't occur easily in nature; acid, bleach, harsh chemicals, and even preservatives, are used in the manufacturing process. Sulfur dioxide is used as a preservative on the wood. In 2005, a Chinese consumer council warned that sulfur dioxide from throwaway chopsticks was connected with an increase in asthma and respiratory problems. Sulfur dioxide is a toxic gas and source of air pollution. Smaller amounts are used in winemaking and preserving dried fruits, but since chopsticks technically aren't supposed to be edible, regulatory restrictions don't apply. Obviously, when you're making something that is given for free and thrown away after use, quality control isn't a big concern. 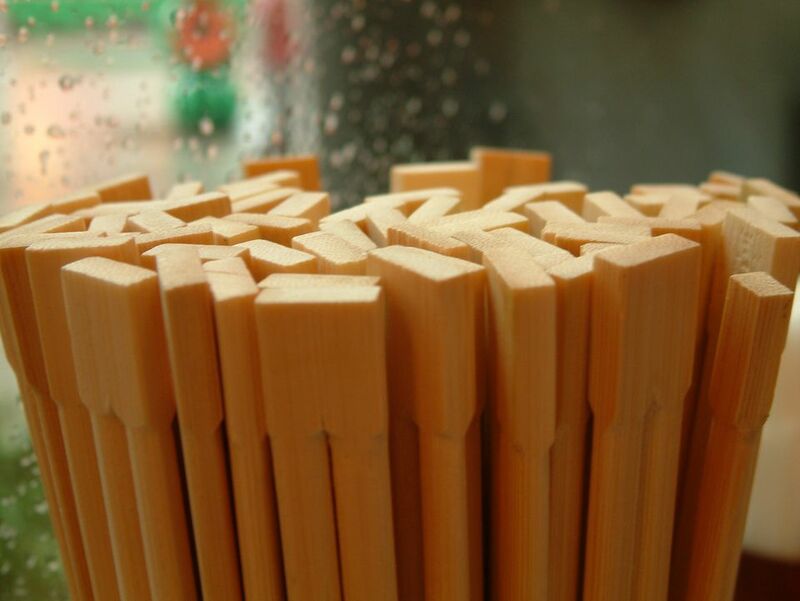 Many factories produce well over 1 million pairs of chopsticks per day. That's more than 12 pairs per second, 24 hours a day. The washing process is merely best effort at that speed. The real washing occurs when you plunge those sticks into a hot bowl of pho at your favorite Vietnamese restaurant. China alone produces an estimated 45 billion pairs of disposable chopsticks — per year. Many of those chopsticks are exported to Western and neighboring Asian countries. Undoubtedly, chemicals can leach out of the wood during use — particularly if you break one of the primary rules of chopstick etiquette by sucking sauces off of your sticks. Dipping chopsticks into hot liquids such as soups is thought to cause the wood to expand, releasing additional chemicals into food. Obviously, quality varies; not all disposable chopsticks present a hazard. The Chinese government warned against using low-quality chopsticks without any clear branding that may have been produced by small companies. According to them, the small, unknown operations are the outfits most likely to produce chopsticks from inferior types of wood that needs to be bleached. Wooden chopsticks seem an attractive alternative to plastic, especially considering the way Americans throw away tons of plastic utensils each year. Wooden chopsticks are easily biodegradable and are often produced from bamboo, a wood famous for being easy to replenish. The long-standing myth that disposable chopsticks are produced with scrap wood products just isn't true. In fact, an estimated 25+ million mature tree (each usually over 20 years old) are logged each year just to make chopsticks that are used once and then thrown away. Demand for cheaply produced chopsticks is just too great. Large swathes of forest are cleared each year — and often replaced with palm oil plantations — to provide timber for the chopstick industry. East Asia simply doesn't have enough wood left. Wood is often imported from Burma, Borneo (one of the last native habitats on earth for orangutans), and Indonesia to fill demand. Japan snaps through an estimated 24 billion pairs — around 200 pairs per person — of chopsticks per year. Sushi, what was once a finger food, and sashimi are frequently consumed with wooden chopsticks. Chinese restaurants around the globe hand out disposable chopsticks with every order whether they will be used or not. Despite a 5 percent tax levied on chopsticks by the Chinese government in 2006, demand has increased. Strong, fast-growing bamboo has been touted as the most environmental option for a variety of applications. From building bicycles and houses to cooking, bamboo works well. You can even eat it. Unfortunately, when disposable chopsticks are concerned, bamboo was one of the worst offenders at leaching up harmful chemicals. You can test this for yourself: put a pair of disposable chopsticks into water that has been brought to a boil then removed from heat — it quickly takes on a yellowish color. pH testing the water yields a higher acidity once chopsticks have been soaked. The answer is simple: avoid snapping those chopsticks apart whenever possible. Unless necessary, don't take them from restaurants that later will have to order new stock. Not only will you potentially avoid industrial chemicals present in the wood, you'll be doing a small part to slow pointless deforestation. Some travelers have actually begun carrying their own sets of chopsticks when traveling in Asia. Chopsticks are exceptionally easy to wash or wipe after use, and many sets come with an attractive case. The most environmentally friendly option is to stick with metal chopsticks — Korea's preference in utensils — but they can be quite weighty and slippery to use for beginners. Another option is to invest in a pair of attractive wooden sticks that were sourced properly, get a case, then stick with them. Put a set in the car for times when you've forgotten to bring them from home. Chinese stars and celebrities are getting behind the effort to curb the practice of tossing chopsticks after one use. Environmentally conscious Japanese diners bring maibashi — "my chopsticks" rather than using the ones provided. Reusing chopsticks is an easy, straightforward way to make a difference. Pass the word along — why not give a nice set of reusable chopsticks as a gift to a traveler you know?